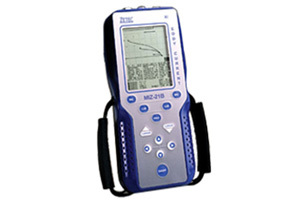 Zetec Handheld MIZ-21B handheld eddy current tester is the most powerful handheld tester on the market for testing cracks, heat damage and corrosion. The MIZ-21B incorporates dual-frequency and digital conductivity testing with nonconductive coating thickness measurement. It operates with an industry standard 50-ohm probe drive resulting in an optimum balance between probe input and instrument output. The price point is of exceptional value for a dedicated eddy current instrument that finds more defects in less time. Wheel Bead Seat Inspection – Inspect crack or flaw with only one pass around the wheel, greatly increasing throughput. Airframe Fastener Row Inspection – Rapidly detect longitudinal fatigue cracks between fastener holes, such as lap splices, with the MIZ-21B and the Reflection (Driver-Pickup) Sliding Probe. C-scan Display for Fastener Holes – The C-scan display is a unique way to present the “big picture” in fastener hole inspection. The method works exceptionally well with an indexing rotating scanner when fasteners are removed. Probe Optimization – The MIZ-21B also includes a Probe Plot feature that plot probe response to both the test and reference specimens over a range of frequencies. This feature helps you choose the probe’s optimum operating frequency for each application.